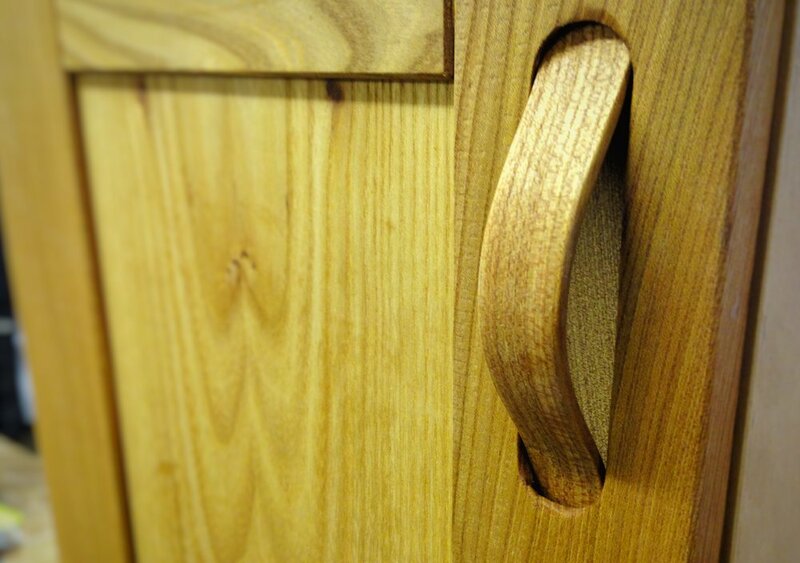 A few years ago whilst designing a commission for a study, the client asked if it might be possible to create handles for the cabinets from the same wood being used for the door frames. 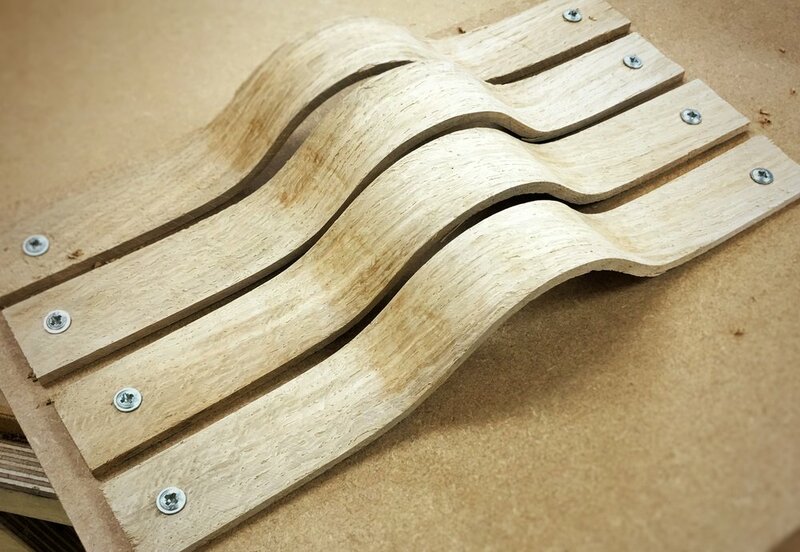 After throwing around a few sketches, I started looking into how to bend small pieces of wood. There were plenty of videos and articles showing a technique using the microwave. This method has the wood soaked in water for 24 hours then wrapped in a wet cloth and placed in the microwave for 30 seconds, whip it out quick and get it into jigs. Frantic. The image below was the first prototype made for approval, I like it but the customer wasn’t as keen, so I increased the curve meaning the recess could be removed. Curve increased and this is what made it in to production. 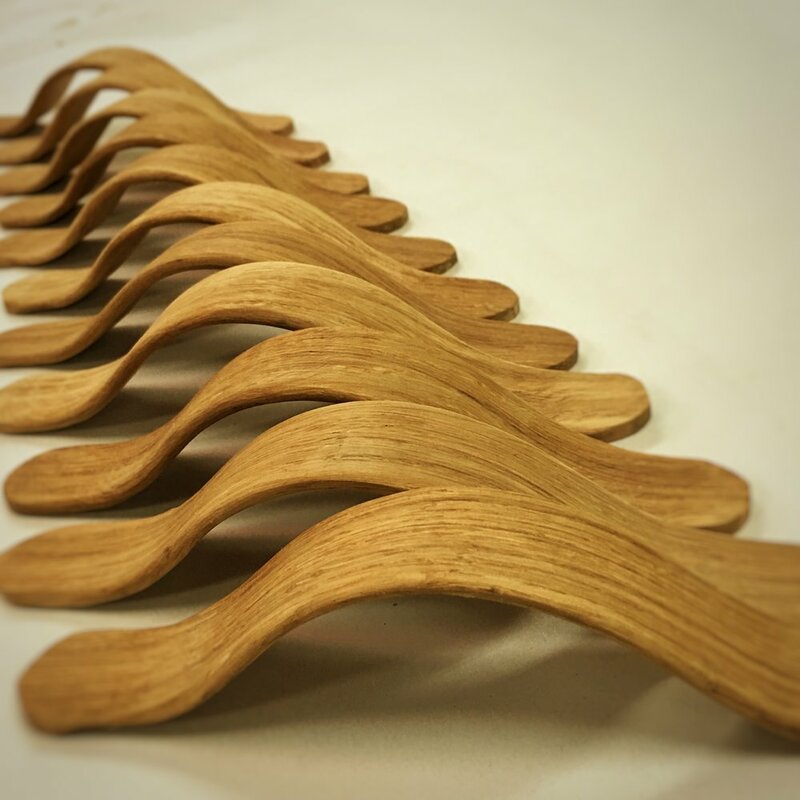 Around 60 handles over five or so different jobs, these handles have become a production favourite in the workshop. Using the microwave method worked but had quite a high rate of atrition. I’d maybe need to cut blanks for double the amount of handles needed as some would just snap or split while getting the form, or the spring back made them unusable. Mid way through the second batch, I came across a core77 article http://www.core77.com/posts/35838/A-Better-Way-to-Steam-Wood-for-Bending-Use-a-Plastic-Bag and immediately found some extra heavy-duty, lay-flat poly tubing 250 microns thick from Kite Packaging. So when making the most recent batch I thought I would take a few pictures, do a little run through of the processes involved in making them. In the past they have been created in Elm, Oak, Ash, and Southern Yellow Pine. 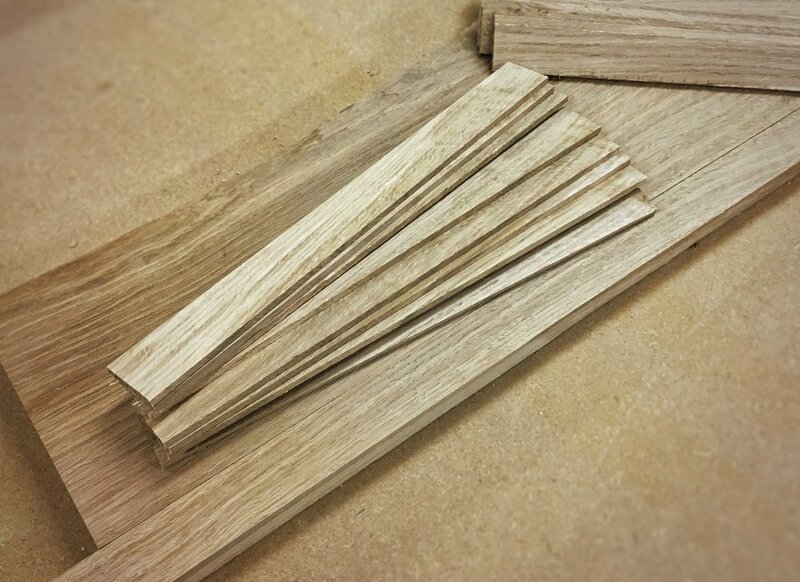 Material selection is key, I’ve found that to get the best consistency is to try and get as close to quarter sawn as possible, so with the piece of stock pictured below I had to rip a couple of pieces off the block, then rip the strips from them. Strips ripped and then cut to around 300mm to get plenty of room and leverage on the bend. I made a bending jig which has two sides, male and female formers, cutting a piece of the poly tubing with plenty hanging in and out of the jig. We popped the two strips into the sleeve, hooked up a wallpaper stripper and placed tension on the jig with the clamp. Herein lies the beauty of using the ploy sleeve, after around 3-5 mins of steaming you can start to apply more and more pressure to the bend, all the while steam is still running through the set up. Once the form is fully closed the steam can be cut off and the jigs allows to cool. I have three forms to enable a batching of 6 handles per day. 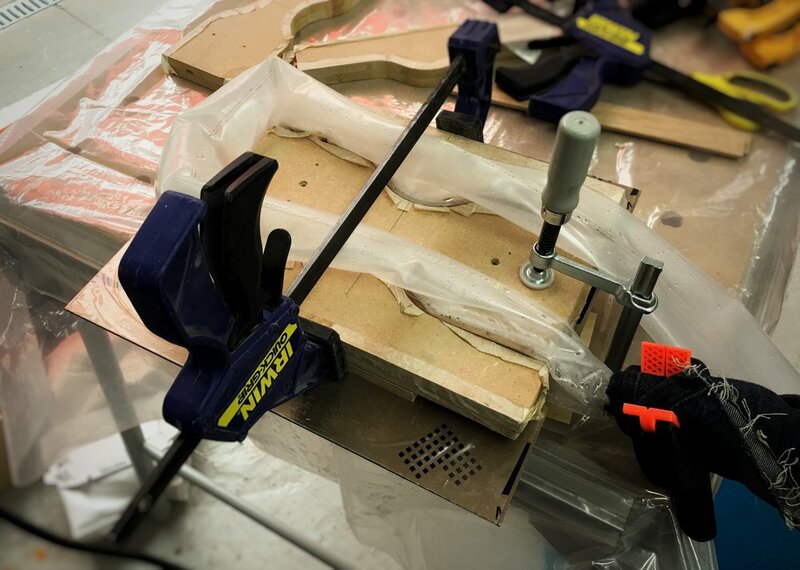 Once cooled the outer forms can be removed, the poly sleeve cut away and clamps then reapplied. This is then left overnight to dry. For the final drying they are screwed down to a piece of scrap for as long as possible. A wee trim to length, sanding, rounding over, coat of oil and they’re done. The doors are then routed out from both sides, a longer slot on the back, these ones just need the filler piece in the back. And there you have it. Boil in the bag steam bending. Well when I say this week, I mean the last few weeks. Absolutely flat out at the moment which is why these updates have been... well non existent. We've had a really varied few weeks, in and out of the workshop, fitting, and spraying. Working on two joinery packages at the moment, a few sets of loft wardrobes, desks, shelving, media rooms, all sorts. On the site where the workshop is based, we are very lucky to have access to quite a nice spray booth, keeping the process in-house. 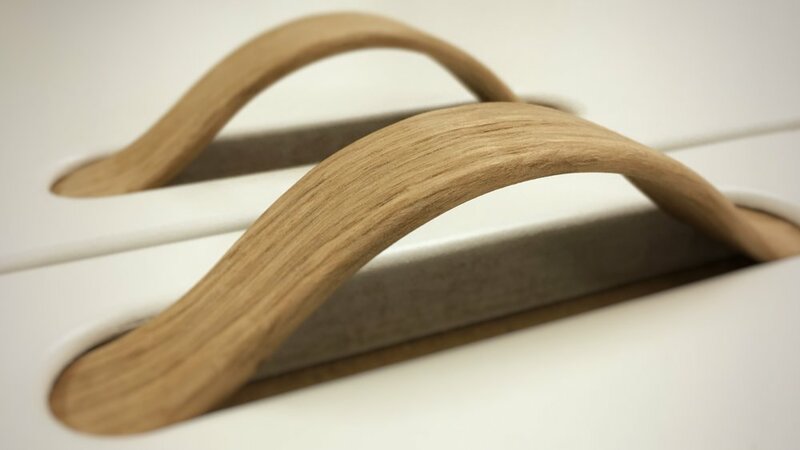 The design has been produced by Yam Studios who are an interior design company with a leaning toward Scandinavian style, so quite clean simple designs using veneers and sprayed finishes. The veneer specified is from a company call Apli Wood which produce an engineered veneer made from sustainable species and formed to create a straight grained consistent look. Each sheet is exactly the same in colour and pattern. This stack I had made up by Read Veneers and is 36 sheets of 3m x 1.2m needless to say we were slightly fatigued by the time it was all in the workshop. One set of loft wardrobes and shelving, quite a nice challenge to scribe and cut the tops in to the roof line. Heaps and heaps of work going on. Jumped on the hairpin leg band wagon. We had an off cut of birch ply with a laminate top and together with a nice set of low coffee table legs, there's a nice gift for brother Robinson. In possibly the biggest news of the last few weeks, a new workshop is afoot! Ooooooooooooooooooo you cannot imagine how excited I am. Measuring in at a beautiful 1100sq/ft and yes, yes that is a 5m wide 3m tall roller shutter. It is an absolute beast, electrical work is all done, a few other bits to get sorted before moving in but can't stop thinking about all of the opportunities this space is going to offer. Will keep you posted on the move and should have some nice finished products to show in the very near future. Great week. Started out putting the finishing touches to this latest project, getting packed up and ready to fit. Tuesday was the first day of fitting which went well but not without unforeseen issues. Every job no matter how well planned and thought out will throw up some kind of problem to overcome. Sometimes it will work in your favour sometimes it takes a silly amount of head scratching to get it looking perfect. It's an inherent part of making bespoke furniture, we pride ourselves on making straight, square boxes which then get fitted in not so straight or square houses. The space was compact which is always challenging, only bringing in the elements in, one at a time as needed. Having the van right outside the front door helped massively, love a good parking space. The home office is constructed in birch ply with an off-white, high pressure laminate applied to it for durability. The L-shaped desk has a raised back section, designed to accommodate a radiator across the back wall, doubling up as a monitor stand. To finish it off, two wall mounted shelving sets for books and display, with base cabinets and drawers for extra storage. The pictures - these are from my phone and as the space was tight I had to use a clip on wide-angle lens. Three days to fit, super pleased with the results and the customer was over the moon. All in, a good productive week, it's nice to have a job off the list. We're getting new some projects underway next week which will keep us busy for the next few months, so the updates will be coming thick and fast. I love making things! The idea - the refinement - the sketches - the calculations - the refinement - the research - the hours of questioning - the CAD model - the refinement - the materials selection - the processing method - the yield - the schedule - the refinment - the double check - the triple check - the ordering - the delivery - the cut list - the refinement. Then the best bit. Getting the ole hands dirty, setting machines, checking accuracy and bringing everything together. Seeing the finished product is awesome, hands down one of the best feelings as a maker, all of the previuos steps and experiences culminating in a tangible useful piece of furniture that hopefully other people will like, bloody brilliant. So this is the crux. All of the pieces on the website and posted to social media all have a story, lots of different materials and methods, giving a myriad, a plethora, a smorgasbord of work all unique. This "blog" is intended to serve as a window to the workshop, will be trying to put up a weekly update on the goings on around the shop, looking a manufacturing processes, tools (my favourite), and generally what goes in to making the things we do. One caveat, I am by no means an expert, self taught through watching countless hours of the likes of Norm Abram and other makers and making countless mistakes. Just wanted to put that out there. Soooooooooo suppose the inaugural post should have something about the start maybe? The first tentative steps in building M W Robinson Furntiture? The Workshop. Note the holycrapwhatamidoing look on my face! Big moment, at this point I was still working full time with half a business plan and a shabby array of tools, BUT I had a table saw, an old Altendorf panel saw that my current employers (at that time) were junking. Needed some love and a whole lot of effing and jeffing to get it located but there you have it. The first step. So what's the first thing you make when you have a new workshop? A new work bench! Made from an old kitchen worktop, pallet wood, haggard old drawer runners and painted with left over floor paint, the only thing new is the vice. Served me well for a couple of years before deciding I needed a much bigger bench, but that's for another time. Gonna call this one a day here, just been going back through some old photos and realised I've got heaps random images from the last three years, so might do a few short features along side the weekly shop updates.